It is a powerful endorsement when a politically liberal and proudly lesbian friend recommends a visit to the Ronald Reagan Presidential Library. We knew right away that we’d find more there than mere political legacy polishing. 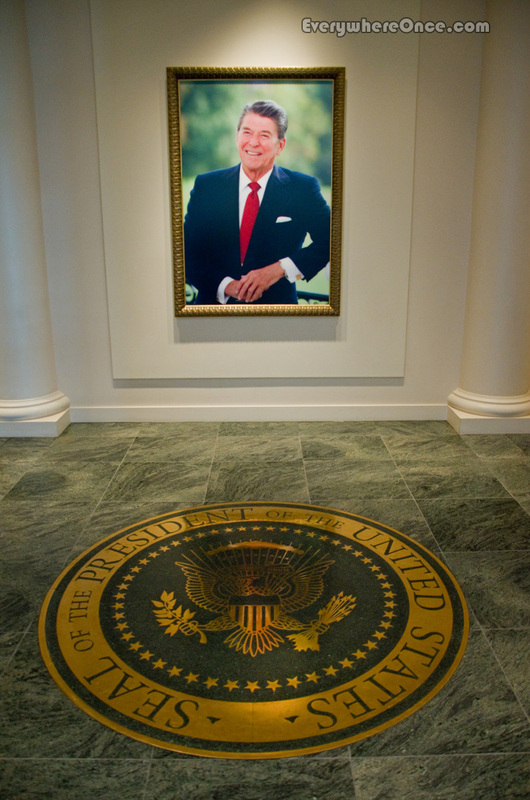 And while there is no shortage of that at the Reagan Library, its collection also contains enough impressive artifacts of universal appeal to make it a compelling stop for political agnostics and Reagan critics too. It goes without saying that ardent fans of the late president will find lots to like in the Library, but history buffs may find some gems hidden within its halls as well. Set on a hilltop above California’s Simi Valley, the Library’s sweeping views alone warrant a trip up Presidential Drive. 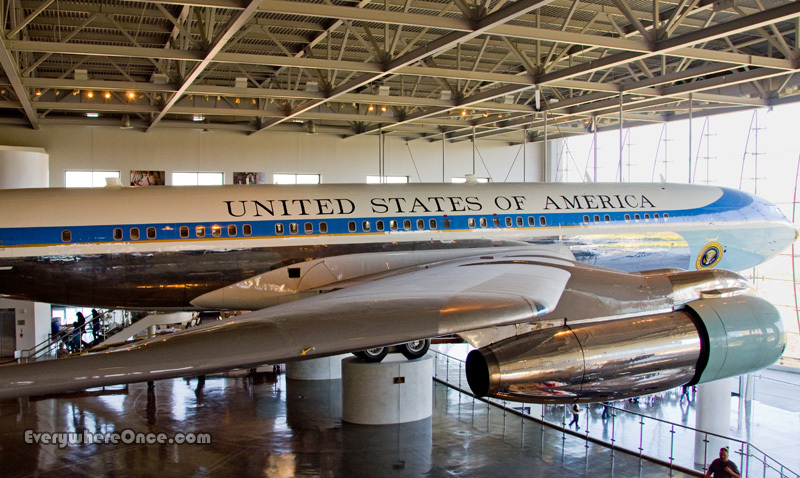 Inside, the 243,000 square foot complex is a modern historical museum that leads visitors through Reagan’s life with a blend of placards, personal items and interactive exhibits. Some are trivial (green screen technology allows you to act out a scene from Knute Rockne alongside Ronald Reagan). Several are experientially awesome (entering a life-sized Oval Office replica and walking through Reagan’s actual Airforce One). Some are weighty (a short film chronicles the several-decade rise of communism near a barbed-wire clad replica of the Berlin Wall). While others are deeply fascinating. On March 30, 1981, just two short months into his first presidential term, John Hinckley Jr. shot Ronald Reagan in the chest and nearly killed him. While much has been written about the assassination attempt and Reagan’s indomitable jolly spirit afterwards (“I forgot to duck,” he said to his wife Nancy in the emergency room; “I hope you’re all Republicans” to his surgeons), how this near-death experience changed him and potentially the trajectory of world affairs is a revelation. The second draft of that four-page, hand-written, letter sits in the Reagan Library alongside a blue pinstripe suit and the 22 caliber pistol that punched a visible hole through it. In his scrawling script, President Reagan makes a heartfelt appeal for each man to put aside “government objectives which have little to do with the real needs and desires of our people” in order to “fulfill our obligations to find a lasting peace.” By some accounts, Reagan’s original draft went even further in striking a conciliatory tone; one that was at odds with the President’s previous confrontational rhetoric. Of the letter, one former administration official said, “I think history will mark this as the start of all that has happened in the [U.S.-Soviet] relationship since.” The eventual thaw in relations was not immediate, though. Reagan continued to be an outspoken Soviet critic and pressed forward with an American military expansion and modernization that some feared was so provocative it risked open war. Upending the political adage that “only Nixon can go to China,” Reagan’s history of aggressively confronting communism failed to protect him from charges of appeasement. The Conservative Caucus lobby even ran full-page advertisements making that case in the most inflammatory way imaginable. While his erstwhile allies tried to portray the old cold warrior as a peacenik, Reagan complained of warmongering among his conservative detractors; echoing earlier charges so often levied against him. The whole episode took on a “through the looking glass” quality that no one could have predicted at the beginning of Reagan’s presidency. Reagan eventually prevailed, overcoming his critics and several of his advisors too, in implementing some of the most sweeping arms control proposals in history after one of the world’s largest military expansions. The conventional wisdom today is that the entire intention of the latter was to achieve the former. Peace through strength, as they say, worked. Perhaps. But that version of history ignores the ferocity with which the military hawks of the time, of which Reagan was originally one, resisted de-escalation opportunities once they arose. For many, switching gears from belligerence to conciliation was so hard to do it calls into question whether doing so was ever really part of the plan. Reagan, meanwhile, somehow managed to make that transition when so many of his ideological compatriots could not. 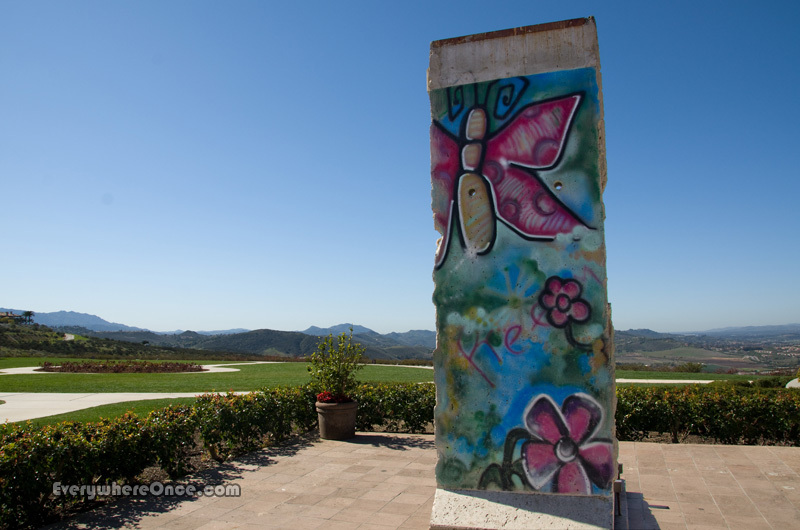 This 6,388 pound section of the Berlin Wall, featuring colorful butterfly graffiti on its “West” and bare concrete on its “East,” now stands impotently among the open acres of the Library grounds. Always in the background of history are the counterfactuals; the things that might have happened but didn’t. Staring at Reagan’s bullet-ridden suit and the letter it spawned left me wondering how the world would have evolved from those dangerous times had Hinckley never pulled the trigger. Or what if Hinckley’s bullet had been fatal? Interesting piece – particularly appropriate as over here the news is dominated by the death of Reagan’s UK contemporary Margaret Thatcher. Fun games to play with. 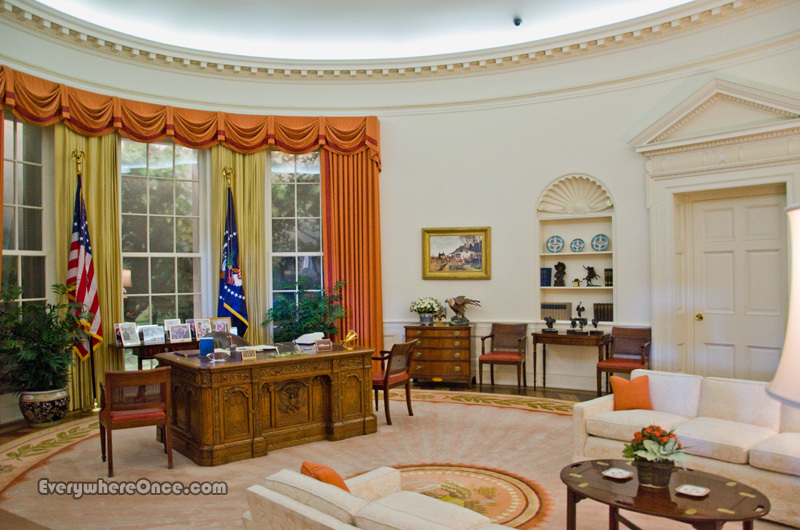 I like the airy brightness of the Oval Office at the Ronald Reagan Library. But what a lonely place for an important object such as a piece of the Berlin Wall. I can see that. But I guess I like to see the Wall there as being delightfully free. And how about that belt buckle collection! I took my very liberal wife on one of our first dates to the Reagan Library. She didn’t kick me to the curb… I think she actual enjoyed the look at “history during our lifetime”. We don’t watch much TV, but the new show, “The Americans” is set in that era and will be interesting to see the history affect the unusual characters in the show. Fascinating piece. I read The Reagan Diaries a couple of years ago and found him to be much more complex than it appeared at the time. He was a man who changed parties and even though he is the poster child for the conservative movement, he held many liberal beliefs.